Geoff has a lot more influence on Chickenblog than most people realize. I was a feliz Mexican finishing my frijoles, chorizo, huevos, tortillas, but he opened up his laptop and reminded me that there is wifi at the Tanglewood Ripplewood Cafe. 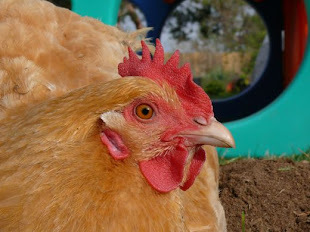 If not for Geoff, Chickenblog would be a quiet, neglected corner of the blogosphere. But can you blame me? it's vacation time! I am trying to make the absolute most of our time on the road, away from the usual duties and chores. I think I took at least two naps our second day in. Snoring, drooling, passed out, naps. The good kind. I needed those. And of course we ate at our favorite restaurant... enough about that. We saw Bill. My brother gave us the best pit-stop, re-fueling, entertainment, laugh filled hour imaginable. And hopefully we can convince him and Alison to come to the woods and putter around with us. I would say "hike," but I do not want to set up any false expectations. Bill and Alison are real athletes, and the only muscles I regularly exercise are my typing fingers, and the arm that brings chorizo to my mouth. Yes, so I hope they will join us, and we can putter around. I did try to post yesterday, but the clock ran out, and I had to quit before I could post. Alex is with us, and William, Max, and Maria. We met Alex at the airport as he was flying homeward from his adventures in Oregon. He. had. so. much. fun. Mom and Ron, and their friends, kept him busy with great activities and art lessons, they had thrifting excursions, and of course Da Vinci Days in Corvalis. Pictures soon... there are so many great ones. I am so glad we have this getaway, this time to explore, relax, and be distracted. My dear cousin may not come back to the Bird House for a year or more... after all the duties she has performed, and kindnesses she has bestowed upon us and our farm. I hope we have not completely worn her out! Hang in there Becky! You are the best. I promise we will return ... life on the road is pretty darn wonderful, but we do miss our critters, and friends. And of course we have next Friday's "Firefly-Serenity" marathon! So much for brevity... everyone is waiting for me to close this lap top and head out for some more puttering! I hope you and your family have a wonderful holiday - there's nothing like a summer road trip! (Although I remember one such trip when I was 12 - my older brother had just got his first harmonica. Needless to say, all our family negotiating and problem-solving skills were put to the test as we worked out exactly how many minutes he was allowed to play that harmonica in the car. 10 minutes after every pit stop, if I recall correctly...) Safe travels! I hope that wherever you are that it is fun and safe! Tell Geoff thank you for this post!